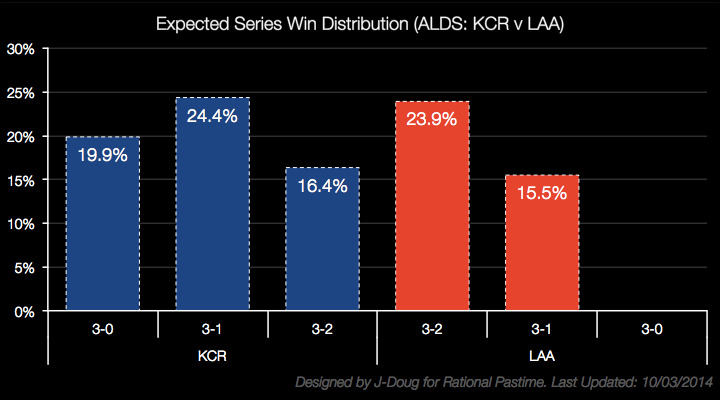 Rational Pastime: MLB Postseason Projections 2014: Will Angels Fall in Royal Upset? 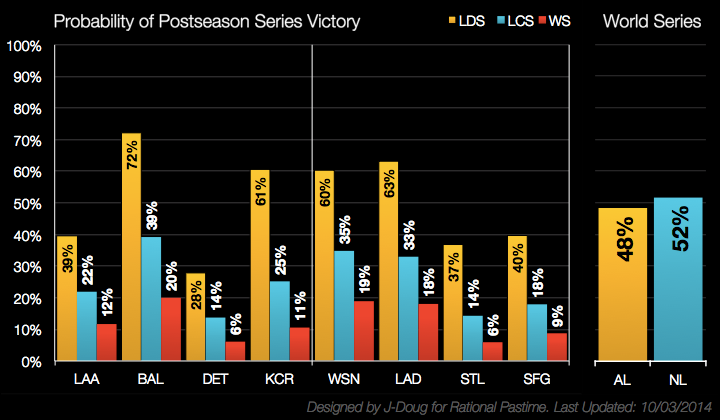 MLB Postseason Projections 2014: Will Angels Fall in Royal Upset? Though both the Baltimore Orioles and the Kansas City Royals are Vegas underdogs as the American League Division Series gets underway, neither squad is interested in conforming to the norms of the market. The Orioles turned themselves into Rational Pastime World Series favorites with an eighth-inning, eight run explosion at home against Detroit, while the Royals flipped the script in extras at Anaheim. With a 1-0 series lead, the Orioles have vaulted to the front of the pack in World Series probability, now 4-1 favorites according to my numbers. The Angels fell out of a dead heat for first and into a dead heat for fourth overall. The Royals, despite their win, are still long-shots. With the Royals' surprise victory on the road against the Los Angeles Angels of Anaheim, Kansas City becomes the favorite to win the ALDS. The modal outcome is now a Royals win in four. However, this is only a bit more likely than an Angels win in five; Game 5 would be a home contest for Los Angeles. 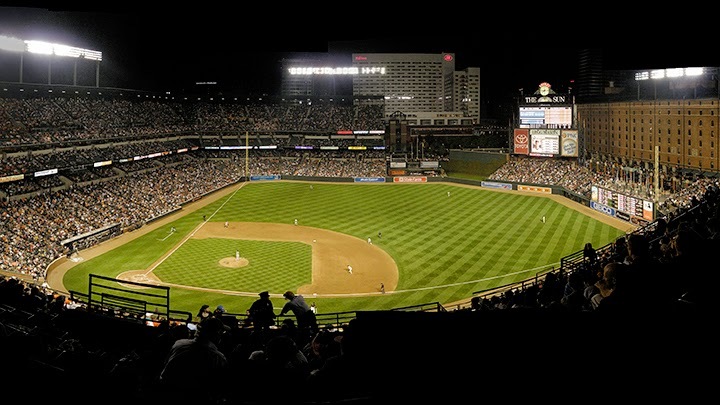 The Orioles find themselves in an even better position against the lower-seeded Detroit Tigers. 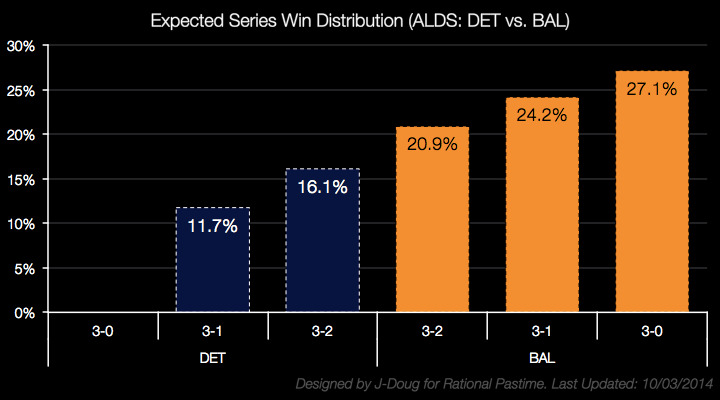 With home field advantage in the ALCS, every scenario in which the Orioles win is more likely than one in which Detroit advances. The Tigers best bet is now to win in five, on the road, in Baltimore, and even then they'll be at a disadvantage. Current numbers have the Orioles completing the sweep in Game 3 at Comerica Park. With last night's American League excitement, it would be easy to forget about the Senior Circuit. The NLDS commences today as the Pittsburgh Pirates take on the Nationals in Washington. 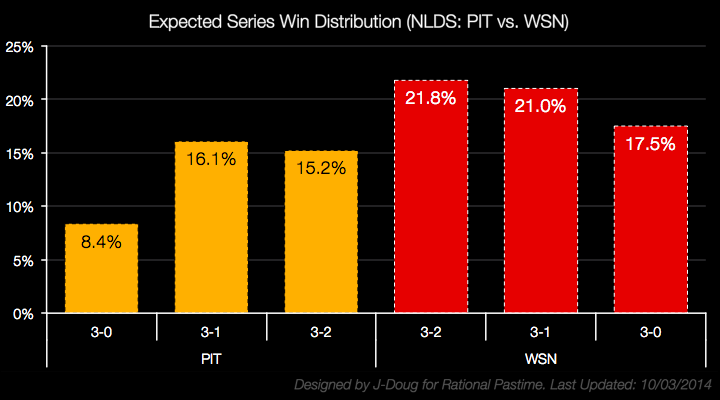 The Nats are heavy favorites, with each Nationals winning outcome more likely than any Pittsburgh series win. The current numbers have Washington advancing in five, while the Bucs' best bet is to clinch at home in Game 4. Finally, in the most lopsided LDS match-up (at least on paper), the Los Angeles Dodgers will be hosting the St. Louis Cardinals. The Cards, with a .514 Power Score, rank at the bottom of postseason contenders according to Rational Pastime's data, while the Dodgers enjoy a .577 true record (good for #2 in the ratings). 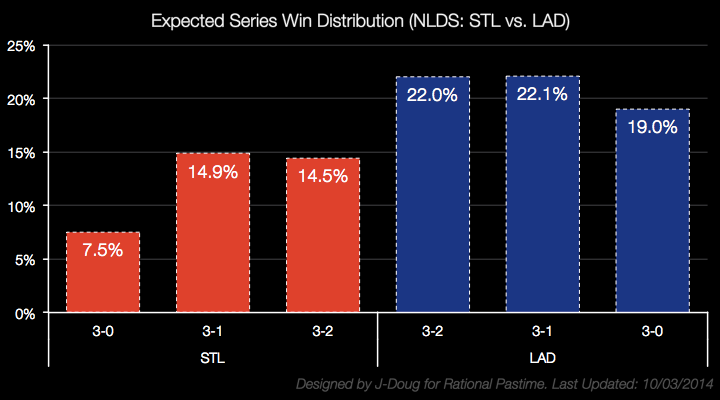 This is why even the most likely St. Louis win (in four) is still 4% less likely than the Dodger's least likely winning scenario (a Los Angeles sweep). Baltimore's eighth-inning carousel ride sent them right to the top of the most likely World Series outcomes, occupying the top three spots. The most likely results are now O's over Nats in seven or six games. Accordingly, at 14%, an October Battle of the Beltways is now the most likely of World Series match-ups that I find particularly compelling. The previous leader, an All-Cali series, is now an 8-1 shot. The most likely World Series rematch remains a replay of the 1966 tilt between Baltimore and the Dodgers. Stop by tomorrow for updated ratings, probabilities and charts following 2014's first full slate of postseason contests.